Remember Backlinks are the main thing of any website which is why the more you invest in them the higher your website will getranked on the Google Search Engine. above all platform + blog comments, guest book, image comment, indexer, ping back, referrer, RSS, track back, etc. 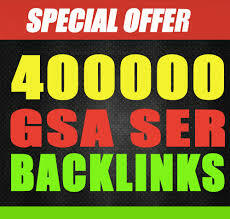 Provide 400,000 Gsa,Ser, Backlinks For Ranking Website is ranked 5 out of 5. Based on 10 user reviews.